Between his JX and Rex The Dog aliases, British producer Jake Williams has been releasing ambitious electronic music for over 20 years. This month sees Williams return to Kompakt, the label that released his first single alongside his canine mascot Rex back in 2004, with Sicko - a track created with a modular set-up focused around modules built or hacked by Williams himself. 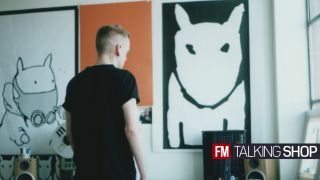 FM caught up with Williams (and Rex) to find out more about his production set-up in 2015, and watch him demo his synth, which he's labelled the RTD-001. Check it out in the video below. "I would have been about nine or ten. I had a Casio VLTone which came from Argos, they were really scarce for some reason so they had to order it in. Every time we went to the supermarket, my mother would take me into Argos and we'd ask if it had arrived. We'd basically given up that it would ever come, and then one day it was there. I think I just played Just Can't Get Enough on it over and over. And maybe Chariots Of Fire." "It's in the spare room of my flat, well actually it's in my bedroom and I live in the spare room. It's not ideal but it's very practical. We use all hardware - old synths and our new modular synth, but we also use Logic 9 and some effects software like Soundtoys Echoboy. The computer is very important, it's where everything gets assembled." "Oh, er… Logic 9! We are just used to it, the first computer thing I used was Cubase on the Atari ST, and Logic was a pretty good next step. We tried Logic X and the changes messed up our workflow so much - plus it looked really depressing with all the dark grey - we ran away back to version 9 (for the time being)." "Well the honest answer to that is the computer. That's the great 'facilitator'. Otherwise there wouldn't really be a way to get so microscopic with the analogue synths, to capture the one tiny part of an experiment that was nice and splice it with another part that was also nice. Basically it's the super-powered friendly multitrack recorder." "Hmm, well over the last year or so it's been about the modular synth. It's something that you can put together little by little, so you start by buying an empty case, and then you slowly populate it with modules. "After we had it about one third full, we went to an electronics class with a friend and started to build modules from kits. After that it became kind of obvious that you could combine parts of different kits, and hack into old equipment to make something that is completely your own. In the video above the bottom two rows are mainly modules we've built ourselves, from kits or by hacking old equipment." What dream bit of gear would you love to have in your studio? "There are bits of gear I fetishise a lot, but know that the reality would be a disappointment. The amount of times I saw an Emulator II on TV and it looked so exciting. You know, like 'wow a keyboard with a disk drive!' That's the main thing we must avoid buying." "We just turn everything on and play around. We make sure there are things nearby that we might need. So there are drums, there are noises, there are old records, the synths are all connected and we don't have to suddenly stop and find a six metre cable." "We're currently making a short animated film, a sort of Rex biography. We're making the sound and the animation at the same time, so basically going backwards and forwards in Logic 9 with a series of QuickTime movies that our animator friend is firing at us. Its' the first time we've written to picture and it's really fun." "Have a separate computer for internet and email and stuff like that. For us it's important to keep studio time sacred and separate. The cellphone gets switched off and there's no internet. When we need to download plug-ins we'll connect the studio computer, but never for anything else ever." "Go to gigs, workshops, films, parties, exhibitions. Find stuff for yourself, do your research. Step out of your comfort zone as much as you can. If nothing new goes in, nothing new comes out right?" "It's fun, it's easy, and then you can make things that make noises."